Three old friends vacationing in Telluride - what's not to like? Well, it turns out Steve hadn't really planned on hiking every day and wasn't finding this the sort of vacation he had in mind. Leroy, Eric and I on the other hand, were happy to make hiking the main attraction just about every day. Steve decided to take a rest day while the others did a hike in the Lizard Head Wilderness outside of town to the southwest, in the Wilson Group. I would have loved to climb Wilson Peak or Mt. Wilson, a couple of 14ers in the area, but it looked like it might be too much for Leroy and possibly Eric as well. So we settled on an easier outing to a couple of 12,000-foot summits that we could combine for a nice outing starting at Lizard Head Pass off SR145. It wasn't a particularly early start when we got on the trail at 9a, but then that's pretty much how these outings in Telluride go - no alpine starts, to be sure. It appears the Lizard Head Trail TH has been moved over the years. At one time (according to the topo map) it started from near Trout Lake, but we were unable to locate the old trailhead when we drove past it on the way to the pass. The newer trailhead adds about a mile but has a much gentler gradient while starting 400ft higher. After traversing some nice open meadows to start, the trail moves into the forest where it crosses into the Wilderness area. There are some fleeting views of the surrounding mountains and Trout Lake but mostly it is forested trail. Around where it meets the older trail version from the topo map (couldn't find any sign of it), the trail turns west and begins climbing 600ft in a series of short switchbacks to a trail junction with Wilson Meadow. Here we turned left and began another 700ft of ascent up to the East Ridge of Black Face. Suddenly the trail opens upon ridgetop meadows with fine views and easy walking - a most delightful section that continues for most of the remaining mile to Black Face's summit. Looking north one sees Sunshine Mtn to the left, San Bernardo Mtn to the right, with Wilson Meadows between them. Lizard head and the higher summits of the Wilson Group rise proudly to the west. One of the lower ones in that direction is Cross Mountain, our second summit, and after a few summit photos atop Black Face we continued along the trail in that direction. The route continues its scenic qualities for several more miles as we made our way along the ridgeline, dropping about 500ft to a saddle before rising again as the trail makes its way just below the south side of Lizard Head. This stately feature for which the Wilderness and trail were named, does not seem to resemble a lizard from any of the multiple aspects from which we viewed it. Go figure. Lizard Head is reported to be the most difficult summit in Colorado above 13,000ft, loose class 5.8 by it easiest route, not something we were even going to consider for this trip. But it was nice to get close-up views of this impressive monolith, one of the most recognizable mountains in this part of the state. Just south of the mountain, the Lizard Head Trail meets the Cross Mtn Trail coming up from the south. Eric decided he and Leroy would take this alternate trail back to the highway while I made my way to Cross Mtn, another mile to the west. The trail goes to a saddle between Cross and Lizard Head before dropping north into Bilk Basin. I left the trail here, finding a use trail that traverses some loose scree to avoid a cliff section on the direct ridgeline to Cross. It took only 20min from the trail to reach the summit shortly before 1p. I found a small register dating to 2009, logging only one other ascent party this year - not a much visited summit. In contrast to Black Face, the entire summit appears to be a pile of talus with almost nothing growing on it. 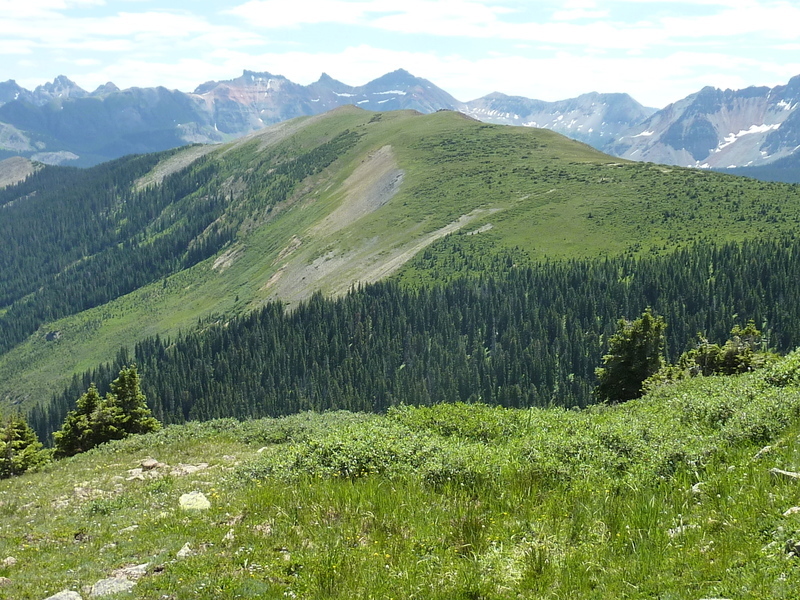 It offers close views of the three nearby fourteeners plus Gladstone Peak (an almost-14er at 13,900ft+), as well as expansive views looking east and south. The ridgeline continuing to Gladstone looks like it would make for a fun scramble but I was out of time for the day. Steve was driving out to meet us at the TH at 3p and I already knew I'd miss that time. Bob: Regarding your July 28 report, there used to be an even bigger, nastier Lizard Head. I guess we'll never know the elevation of the earlier version, or see a picture of it. Very unusual to have a whole mountain collapse all at once. I'm not a climber and not familiar with that part of Colorado, but if I were nearby, I'd visit that place just out of curiosity. The skyline of the mountains to the southwest of Telluride was changed last night when through some mighty upheaval of nature, the taller spire of Lizard Head fell with a roar to the depths below. During the night people living on the mesas near Ophir heard a sliding, grinding noise, which disturbed the atmosphere and gave the impression of an earthquake. This morning they discovered that the upstanding rock which had been given the name of Lizard Head was gone. The smaller spire which was formerly inconspicuous by the side of the head is now standing single and alone, pointing to the sky, a long sentinel of last night’s upheaval. Millions of tons of rocks, conglomerate and earth went down without apparent cause or reason. There are no known photographs of the original Lizard Head.